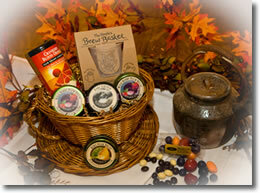 We offer handmade gift baskets that can be created to fit any holiday or occasion. Want to send a gift to someone? We offer gift boxes that can be mailed anywhere! A great present for those occasions when you just need a little something…2 oz. Bags of Clarion Blend or the Holiday Blend (Chocolate Cinnamon Hazelnut) decorated with a ribbon and personal note. *Must be picked up immediately because of the fresh baked products.